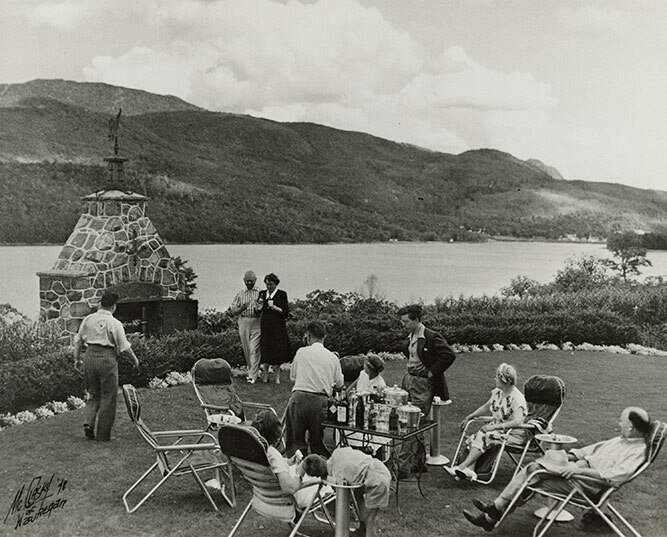 Black and white photograph of James Franceschini entertaining guests at his estate, Duferen Haven, in Mt. Tremblant, Quebec. The famous ski hill of Mt. Tremblant is seen across the lake. The guests are shown relaxing on chairs around a table filled with drinks. The lawn is nicely manicured and decorated with plants. A large brick outdoor fireplace is also visible. According to James' grandson, James McCreath, this photo was taken in 1954; however on the bottom left corner handwritten text reads: "McClasky '48 (illegible) Waukegan." James arrived in Canada in 1906. By 1912, he had founded Dufferin Construction and became well known nationally. As the company became increasingly more successful, James was able to move into the construction of highways, provincial roads, rail lines and suburbs. Within three years – at the age of 25 – James became a millionaire.